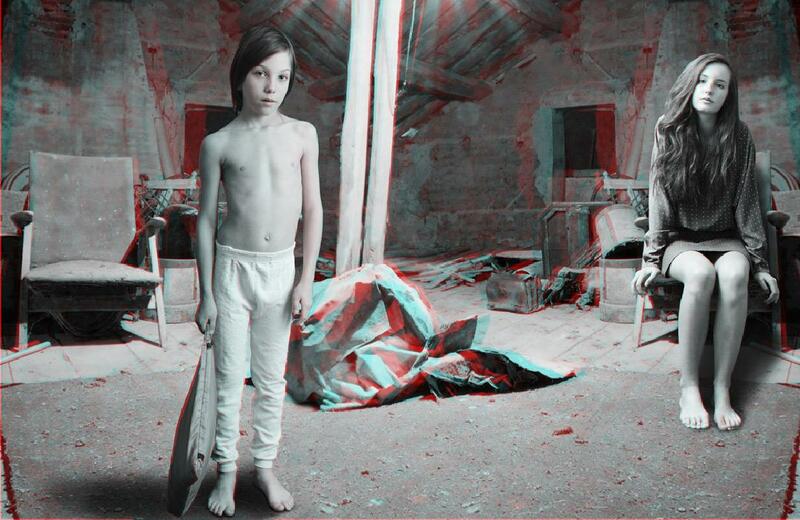 3D virtual reality can only be perceived when wearing red / cyan anaglyph glasses. 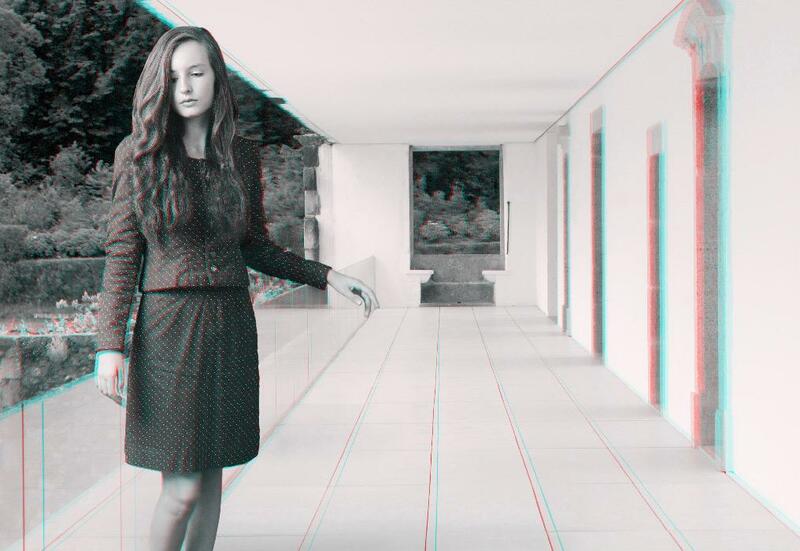 Publication Anaglyph Mireille Loup, Publisher Images Plurielles, 2016. Giclee printing process with Ultrachrome ink on Harman Baryta, Dibond mount on aluminum. Wooden painted frames H 30 X L 40 inches. Limited edition of 5. Wall paper print, H 55 X L 79 inches. Limited edition of 10. Perspectives on the way ahead, a text by Cécile Camart translated by Janine Lajudie, August 2016. 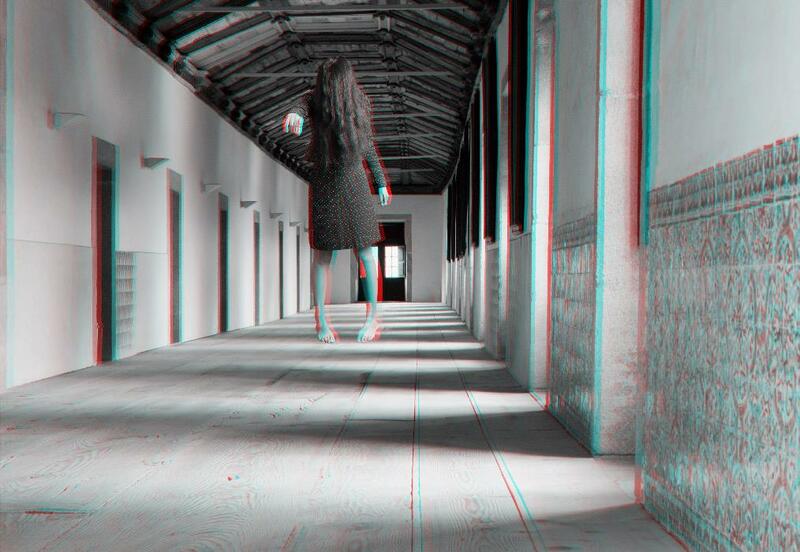 The anaglyph process uses a stereoscopic method in order to recreate 3D binocular perception by using images and complementary colour filters where one of the images is red and the other cyan; if they are then observed together through a filter of the opposite colour, the image appears in relief, at the same time three-dimensional and virtual, whereas it already exists, detached, as a two-dimensional image. Confusing at first, the use of this ancient device is nonetheless central to Mireille Loup’s approach; it produces the very materiality of the images created (their transparency, their plasticity), but also their possible readings, literal and symbolic. The sensory experience of the 53.77 series mediates two simultaneous points of view, as the depth effect is linked to the distance between the original image and its double; it is this phenomenon of diplopia that is constantly re-adjusted by the movements of the viewer. Far from being a formal game, this very technique fully reveals the aesthetics of the undecidable narrative that characterizes this photographic series, and has probably determined the work of the artist for over twenty-five years. In 53.77 one can discern faint reminders of the white images of the series Mem, realised in 2009, which gave birth to the series The Others / Les Autres (2011), where three adolescents with expressionless faces, wreathed in spectral light, wandered inside timeless places, a reference to the film by Alejandro Amenábar. Neither a series nor a sequence, the photos shown in 55.77 display new focuses. If the existing narrative throws confusion upon the identity of the narrator, it is due to spatial and temporal cuts that juxtapose several separate and yet interconnected scenes through recurring architectural clues or perspectives seen from various angles. Within these ancient, antique decors, as they shed their successive skins - marble, stone, plaster, wood, brick - a young woman emerges successively as a vestal, as Venus or as a contemporary nymph mimicking in an overstated manner the poses of Hellenistic sculptures and of Florentine Renaissance painters. These remanences announce the flight of memory, the escape of the mind that wanders inside these spaces while following the thread of an ars memoriae. To each place, a courtyard surrounded by arcades, a corridor, attics filled with rubbish and treasures, the edge of a fountain, corresponds an evocation that, in the suspended, frozen gesture, in the petrified walk, liquefies oblivion, dilutes it to the surface of the picture, and deposits on the ground the stasis of rainwater. The rituals associated with offerings, palms open, hands and cloth outstretched, precede each stage with an emotional memory linked to the history of the places, charged with collective stories: in this cloister, which could be that of a Lisbon museum dedicated to azulejos, the background walls, adorned with tiles, come to life describing mythological, biblical or gallant scenes where the eternal poses that adapt to the artistic styles of intertwined eras are replayed endlessly. This permanent rupture in the narrative, caused by temporal deceptions, increases when the two models - a child, this young woman - cross without looking at each other, absent to themselves as they attempt to escape the settings in which they seem to have broken in. Are these beings real, or are they the fruit of the imagination of the narrator? Starting with the boy and the young woman, who is inventing who, and who exactly dreams about who? Is the viewer recreating places that do not exist – what are the apparitions that these spaces are housing? Spiritualist and fluidic photography sought to record the invisible, to fix on the emulsion what cannot be seen from the world of the dead that are being recalled, to prove scientifically the continuous existence of the soul, of thoughts and of emotions; similarly, the latent images of the 53.77 series would show more than characters, presenting apparitions, ghostly gestures, levitation and the expression of repressed, sudden emotions. Under the arcades, the young woman stands suspended in space like a spectral silhouette, her head hidden by the hair that falls on her face, while under the eaves, a central scene announces Mireille Loup’s legacy. In between the play of a mirror that reflects a pile of cast-offs, and two family portraits - photographs of hieratic men, whose contours are blurred at the corners to create a tondo - a vestal virgin poses. A synthesis of American pictorialism in the manner of George Seeley, it is indicative of a taste for symbolism transposed to the photographic act, in itself just a process, a suite of repeated gestures; it finally reveals the importance of the texture of the image, of its materiality, formed by overlapping previous images, memories freed, rehashed fictions and wanderings of the mind. In each of these images, as in their complex and anachronistic arrangement, something is missing - a link between gesture and object, between the ritual and its representation, between reality and its presentation. Something escapes, like forgetting, like the empty spaces of a room of one’s own, like an identity in the making within "pure perspectives". So Hubert Damisch describes the Urbinate panels or perspectives, utopias of cities associated with the city of Urbino, painted during the years 1460-1500: they anticipate a fiction, he says, a representation which we are not sure has just ended or is about to begin. "The way ahead is free. We are waiting inside a world from which we are estranged. " Cécile Camart is a historian in contemporary art, senior lecturer at the Nouvelle Sorbonne University-Paris 3 and member of the International Research Laboratory in Arts (LIRA-EA 7343). She is the author of Les Mondes de la médiation culturelle. Approches de la médiation, vol.1, Médiations et cultures, vol.2 (Paris, L’Harmattan, 2016, with F Mairesse, C Prevost-Thomas and P.Vessely). Models: Marianne Mazet, Lasko Lascaridis. 53.77 was exhibited in Les Rencontres d'Arles 2012 (France), in the Grande Halle of the Parc des Ateliers. Invited by France Culture Radio on the 18th of July 2012, at Pas la peine de crier, a broadcast by Marie Richeux , Mireille Loup speaks about her series Each of my faces and 53.77 shown during the Rencontres d'Arles 2012. Her interview starts after the writer Gilbert Léautier, 32 minutes into the broadcast. To listen Mireille Loup in Pas la peine de crier, France Culture, by Marie Richeux.